Great template! I have a question. after that the “sample site” slide out on mouseover . Sorry for my bad english 😀 ! It’s not possible at this time sorry. How does one adjust the timing for the slideshow? Slideshow only on homepage FIXED. Where do i set it to only display in homepage?? I can’t find that option in template manager..
You don’t have to set it. It should work automatically. I am having problems updating the AddThis link, whenever I save it automatically deletes and leaves the box empty. Any ideas? Hey There – great template – just a quick question though – how do I change the titles in the slide show? Is it in the templatedetails.xml file? Cause I tried that and still showing slideshow 1 description? Perhaps I have put it in wrong area? Cannot figure out where to upload slideshow images to. Does anyone know where to find the ‘slideshow’ folder? Which file i have to replace to fix the slideshow. I only want the slideshow on the home, but i don’t want to replace everything. It should work fine. Try to uninstall it and reinstall. Is it possible to add additional slides to the slide show? Yes but you have to do it manually then and recode the slideshow script. Hi, thanks for yuor fine template. I would like to add some images to the slideshow but i cannot understand where, i tried to add the right div on the index.php but when saved and uploaded i get error about COPYRIGHT etc so i must take back the original one. i will also happy to center the thumbs under the main slider, if is impossible to add more slides. Thanks in advice. From Florence. I would say that this is a great theme if you’re not looking to get some simple css going. I don’t know if it’s joomla-standard css classes or custom made but they’re worthless when it comes to the naming part. It’s also crap when it comes to dividing stuff up for optimizing css use (makes it a pain in the — to edit something so simple as a padding on the text below titles etc). Love the layout but the css gave me a headache and I’m atleast advanced when it comes to css. What do you have problems with exactly? Maybe I can help. Suggestions? I honestly can’t bare to keep coding right now and this site is my least prio right now so I’d appreciate a helping hand. Also, I’d just like to have the normal news content instead of the four boxes that pops up when you login on the site (Joomla!, Beginners, Upgraders, Professionals) – Where can I edit/remove them? That’s in the Joomla settings. It’s not from the template. Contact me with your URL and I will help you. I have used a table in an artikel and all borders are set at “0”, but they do show in my website. I use the extended version of TinyMCE as an editor and check my sites in IE and Chrome. ENOX is a real fine template to work with. You will have to edit the css file and remove the border 1 from the table css. could you please advise me on how to create submenu items so that they drop down from the main menu bar? Which element in the CSS do I need to amend to change the menu button colour from red to my colour choice? same question – would love to know – Thank you (great template by the way ! 🙂 ). Never I found it … you need to change the mainmenu-h.png file in the images folder. I have some menus. but whenever i click on the menu, it will go to ‘home’ article. whenever i click on any menu, it goes to Home article. My ‘Default Page’ is Home. But why other menu show only home article. what do i do wrong. please help. TQ. Hi. Slideshow appears on every pages. How to set slideshow work only on home page?? I thought it’s fixed. If you replace the template with the newest version it must work. Contact me if not. I cannot get submenus (drop downs) to work correctly on any menu item other than home (the default). When I try to make a sub menu on any other menu item, I must first click the parent menu item (which takes me to the linked article of course) and THEN the drop down item appears below that parent. I found the problem – didn’t have “Show sub menu items” selected to yes. Sorry for the waste of bandwidth! I’ve the same problem. Where do you find “Show sub menu items” ? I also found the same problem.But its nice to look at..finally it is bug, i think..
I’m looking for the menu suffix class to realize the top menu (Home, site map…). By default if i set my menu in position_0 (Joomla 1.7), it is shown as a vertical list (like “Latest News” content on your demo). I have fixed the jquery and slideshow problems. I’ve a problem with joomlas archive function. The templates css works well, but when I click on the archive module then the css destroy the sites view. Hi, This is a great template my only problem is in IE the background should be white of the content but it only shows as a line at the top of the screen. There are no problems with other browsers. This is fixed now. Download the new version. Very nice template using for my new website. Any update about fixing the problem in Internet Explorer. In IE8 I miss the shadows and see square corners of boxes and in IE 9 I see only in compatibility view the right view. IE does not support those. I have JoomGallery installed and, only when using the ENOX-TG template, the slideshow (for the Gallery, not the one on the front page) doesn’t work. I asked the author of JoomGallery about it and he suspects the issue is how the ENOX-TG template deals with JQuery. All I know is other templates, the JoomGallery slideshow works ok. Any thoughts? I’ve set my homepage as a category blog. It’s listing all articles in the category, but has no separation between articles. Should it have some sort of horizontal bar or separation feature between articles? Is it possible to replace slideshow by an another module ? What is the central position ? Hi, I tried changing the images in the template folder slideshow folder, but they are protected from editing/deletion. Any way around this? tnks. How Could I be able to replace slideshow by using a module. what is the position for that. I wish to use one of your templates (Black #77-7744), however I need to add a website statistic tracker. In order to do that, I have to modify the index.php file. I have no problem with the agreement of keeping your site tagged with mine, so I am not requesting link removal. Can you allow my addition of the tracker code, or perhaps send me a version of the file with a statistic tracker in it? Also, I noticed that when I selected the template, the horizontal buttons up top disappeared and I got vertical choices on the left instead. Why is that and how do I get the horizontal ones that your picture shows? I am using Joomla 1.7 and currently using the Atomic default which accepts the tracker code. One question: can a further two rows of links be added immediately under the ‘Main Menu’?! Hi, I am a novice web developer and I need a little help in customizing your ENOX (Black Joomla Template. What I would like to do is make the “breadcrumb” menu position to be the same width as the centre column, is this something that can be done relatively easy? And if it is can you please provide me with the code that will achieve this? If you can help at all that would be greatly appreciated. This is a great template, I have been using it for a couple of months and it has really upgraded the image of my site. So thank you very much for a great template, keep up the good work. Bullet points in the main content areas (articles, etc)? Can’t seem to get them to display? I’m planning to use the ENOX template to redo my Gene Watson Fan Site. I would like to add content under the slideshow, but I didn’t install the Joomla! 1.7 sample data & can’t figure out how to add content beneath the slideshow (in the middle section. 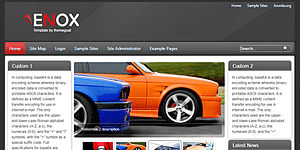 I use Exox TG template for my site (JOOMLA 1.6) but i have problems with chrome and IE. I dont’have problems with Firefox. Hi, is there any option how to get slideshow only for one page (Home)? The path to the file is “templates/enox-tg/css/styles.css”. This should work, but nothing gets displayed. Even firebug tells me that the style is not overwritten. But again no luck with this. It would be nice if the author could try this by himself. A list is not useful at all in the content if you cannot really distinct it from a paragraph (like it is now). Line 43 of the index.php file has http hardcoded. This causes a security warning in ie if you are trying to run the site through https (SSL/TLS).